Os Gemeos (pronounced "ose zhe'-mee-ose.") are two artists from Sao Paulo, Brazil. 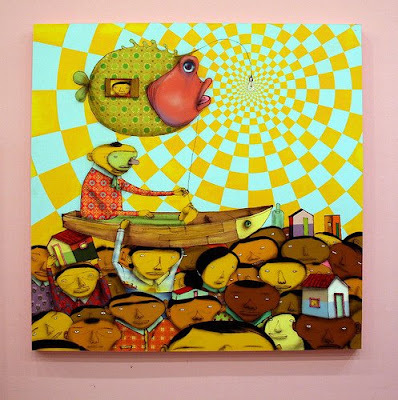 Gustavo and Otavio Pandolfo were born in 1974, identical twin brothers whose pseudonym, Os Gemeos, translates to "the twins" in Portuguese. In addition to their incredible works created on the streets of Sao Paulo, the twins have in recent years exhibited their art in museums all over the world. Too Far Too Close is the brothers second solo exhibition at Deitch Projects in New York.The gallery has been transformed into a fantastical cityscape with houses, doors, and passageways, all brought to life with their signature style of imagery. Building upon a group of artworks created for the Museum Het Domein in the Netherlands, this show features new paintings, sculpture, and installation bringing all the magical moments of their work together in one tightly knit dream world of an exhibition. The show opened in New York on the 28th June, if like us you can't make the show, check out Mikeion's flickr who captured the show on the opening night. View the full set from the show here.